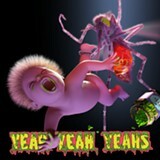 In the video commentary associated with Vice magazine's early stream of Mosquito, the excellent fourth album from New York City trio Yeah Yeah Yeahs, the band's frontwoman, Karen O, explains the album thusly: "It's like a Yeah Yeah Yeahs soul record, or our version of one." Which doesn't make a huge amount of sense at first: This is a band, after all, that's made its name churning out strutting, seething, searing art rock, and this album, save for the gospel choir on opening track "Sacrilege," doesn't have much in common with what we typically think of as soul music. It does, however, have bizarre forays into swampy synth work ("These Paths") and sugary-sweet pop ("Always") and light alien worship ("Area 52") and — wait for it — roots reggae ("Under the Earth"); there's a cameo by the horrorcore rapper Dr. Octagon, aka Kool Keith ("Buried Alive," the album's only truly regrettable moment) and a sample culled from a subway car (the aptly titled "Subway").